Due to the increased digitization of society, both the individuals and businesses are exposed to malware threats than ever before. In recent years, use of computers and the internet has skyrocketed and, along with that, hackers have begun to target innocent users with a wide range of malware. Cybercriminals are implementing new and effective methods to infiltrate computers. One of those methods is the use of Ransomware. It is by far the largest cybersecurity threat to computing devices, individuals, and businesses. The main intent of the vast majority of these ransomware threats is to make money from the victims. There are two major types of ransomware in circulation. The most common type of ransomware that affects a vast majority of users is crypto ransomware. Its primary aim is to encrypt the victim's personal data and files. Another type of ransomware is the locker ransomware which is designed to lock the victim's computer and prevent them from using it. Let's take a closer look at how encryption ransomware types work and how to remove encryption ransomware. Encryption Ransomware is a group of ransomware whose primary intention is to extort money from its victims. It does that by encrypting victim' private or confidential data like documents and essential files; threatening to delete them unless the victim pays a ransom. What Does Encryption Ransomware Do? 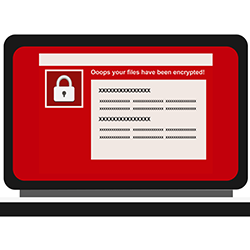 Once inside the host computer, Encryption ransomware searches the host system (and other connected networks or external storage devices) for specific file types such as .doc, .docx, .jpg, etc., and then encrypts those file types, rendering them inaccessible to the victim. How Encryption Ransomware Infects a Computer? The two main ways by which Encryption ransomware infiltrates a victim's computer is through email attachments and drive-by-downloads. In a “drive-by-download" scenario, websites infected with Encryption ransomware try to install the ransomware onto the victim's computer when they visit such sites. It infiltrates the victim's computer by exploiting either the security flaws in the web browser or the Java software. Another method of Encryption ransomware transmission occurs when the user opens a malicious attachment (containing Encryption ransomware payload) from spam emails. Once opened, the Encryption ransomware gets installed on the computer. Once you are aware of the Encryption ransomware on your computer, make sure to use your computer in Safe Mode. Boot your computer in 'Safe Mode with Networking.' You can do that by pressing 'F8' key when your computer boots. To remove the Encryption ransomware, install a good antivirus like Comodo antivirus. With its powerful containment engine, Comodo antivirus will remove the Encryption ransomware. Do not open any email attachments from suspicious or unknown senders. If the email is from someone you know, confirm its origin before opening. Install good antivirus software such as Comodo Antivirus on your system, and make sure it is running and up-to-date. Know how to recognize Encryption ransomware. Make sure to backup your computer and always use up to date security software (antivirus) equipped with specific anti-ransomware technology. Above all, never pay a ransom as it only encourages the attackers behind the CryptoLocker ransomware. Encryption ransomware is a severe threat to your computer and your data. By practicing safe computing habits and by using up to date security software, you can stay protected from Encryption ransomware. Do your part by remaining vigilant and installing trusted security software such as the Comodo Antivirus. For enterprise users, Comodo Advanced Endpoint Protection (AEP) would be ideal. With a built-in containment engine and 'Default Deny' platform, Comodo AEP provides 360-degree protection against any malware threat including Encryption ransomware. Comodo AEP includes antimalware, antivirus, and firewall along with a Host Intrusion Prevention System (HIPS). It prevents Encryption ransomware attacks by examining and sandboxing suspicious apps and processes.